SpacePath Communications (‘SpacePath’) is launching a new range of redundant, high power uplink amplifier systems at IBC 2018. A 1:1 redundant controller in a compact, 1U design. Compatible with all STA-series amplifiers, the indoor control unit provides full remote control of up to two amplifiers and a redundant switch. The unit also provides easy-to-use control over an outdoor redundant amplifier system with full monitoring and control of amplifiers. The user-friendly design features attenuation setting, automatic gain control, go-to power, log/trend analysis and Ethernet output, enabling remote operation. A 1:2 redundant touch screen controller which features an integrated, graphical user interface. The indoor 3U unit provides full system control, and monitoring & control for each of three amplifiers in the system. For added functionality, an Ethernet output enables convenient remote operation. SpacePath Communications 1-2 Redundancy System. Available in either 1:1 or 1:2 redundant and power combined configurations, these lightweight, systems can be installed or removed for routine maintenance without interruption to a transmitting amplifier, and accomplished by a single person without the need of tools. 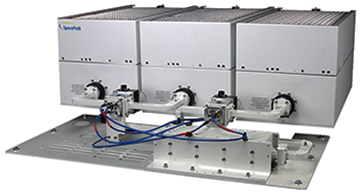 Fully scalable, the 1:1 redundant system incorporates two amplifiers, while the 1:2 unit has three. Their IP-based, modular designs accept a wide range of compatible amplifiers providing a seamless, inbuilt upgrade path when more carriers or linear power is required. The new redundant controllers and systems complement SpacePath’s full range of products which are ideally suited to all mission-critical satellite communication segments, including, digital satellite newsgathering (DSNG), military satellite communications, large teleports, mobile applications and flyaway systems. Newton Burnet, Director, SpacePath Communications, said that as a UK manufacturer of satellite uplink amplifiers and sub-systems, the company's goal is to continually innovate with designs and functionality based on customer-driven feedback. 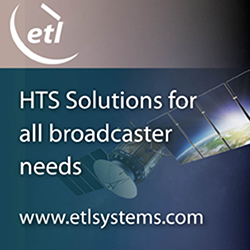 Our expanded line-up of redundant, high power, uplink amplifier systems fulfills this objective and these will be displayed at IBC alongside our amplifier and system range that caters for all mission-critical SATCOM segments.